Vivid blue spinel with white carbonate in calc-silicate rock, Kimmirut area. Photo by Philippe Belley, UBC. Researchers from the University of British Columbia published the first scientific study of cobalt-blue spinel in Canada, a mineral that produces fine gemstones that range from red and pink to violet and blue. Philippe Belley, a recent PhD graduate of the department of earth, ocean and atmospheric sciences, and UBC mineralogist Lee Groat traveled to Baffin Island in the Canadian territory of Nunavut to investigate the origin of spinel’s blue variety, highly prized for its intense natural colour, high transparency and limited supply. They found that Baffin Island spinel contains up to 500 parts-per-million of cobalt, which gives it a vivid blue colour that is comparable to the best sources worldwide, found in Vietnam and the Himalayas. After identifying an excellent rock exposure on the island, the researchers employed advanced exploration techniques such as imaging with drones. 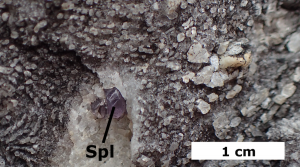 This allowed them to discover and analyze 14 occurrences of spinel, including two occurrences of cobalt-blue spinel. Their analyses led them to conclude that the mineral formed 1.8 billion years ago from sedimentary deposits of dolomitic marls and dolomite-bearing limestones on Baffin Island. These sedimentary rocks metamorphosed at temperatures of about 800 degrees Celsius under immense pressure and then the magic ingredient — cobalt — was added at some point during sediment deposition or up to early metamorphism. “It’s a simple recipe but you need to combine the right proportions of chemical ingredients,” Belley said in a press release issued by the university. “Previous work on other deposits suggested that cobalt was transported during high-temperature metamorphism, so our results change the way in which people would explore for cobalt-blue spinel deposits,” Groat added. 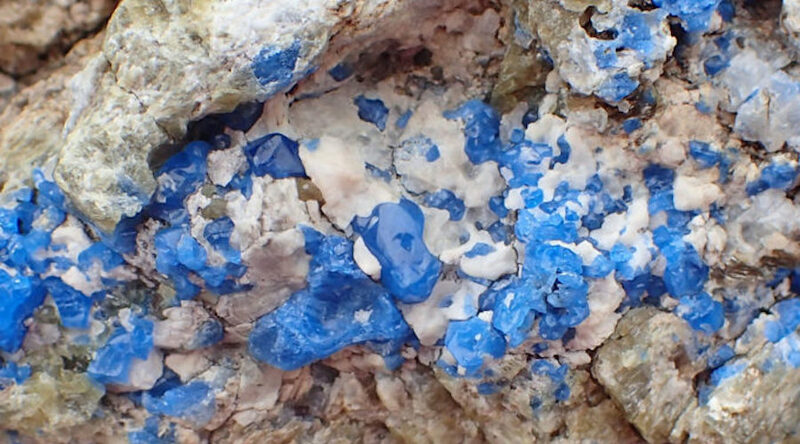 Although it was present in the areas under study, the blue mineral only existed in high-enough concentrations to produce gem-quality stones in small, localized segments of the island.